Alex Smith has joined Hastings United for the 2018/19 Bostik League South East season. 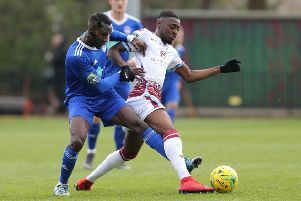 Hastings United Football Club has completed the signing of a player who once made a Premier League appearance for Fulham. Alex Smith, who came on as a substitute for the Cottagers against West Bromwick Albion during the 2012/13 season, has joined Hastings ahead of the 2018/19 campaign. Hastings manager Chris Agutter told the club’s website: “‘I am thrilled to welcome Alex to the club. I know him from his time at Eastbourne Borough and have witnessed at first hand what Alex is capable of. “He is an outstanding talent, possesses a wand of a left foot and I know playing from wide right he will cause Bostik League South East defences an awful lot of problems. A product of the Fulham academy, Smith spent 11 seasons with Fulham and signed his first professional contract in 2009. Smith later had loan spells at Leyton Orient and Stevenage before joining Swindon Town and then Yeovil Town. He has since played non-league football for Woking and Eastbourne Borough. Two products of the club’s academy, goalkeeper Louis Rogers and right-back/midfielder Bradley Pritchard, have also committed to the club for next season.